You won’t see a pot belly stove roaring at the corner Quick Stop. But you will at the Shrewsbury Co-op at Pierce’s Store. Things haven’t changed all that much since 1865. You’ll still find penny candy and a few other Vermont staples…authenticity, independence, community spirit, and a warm welcome. Thank you Sally Deinzer and chef Rob McKain for the great tour! And as promised, I’ll be drawing two random free print winners for February from my subscriber list this week. Ooh I love the Pierce store ! My father took me there when we went out hunting in the fall . Stopped to get soda. One of my fondest memories of Vermont past. So interesting to observe your technique. 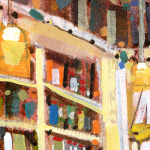 Love the painting of the General Store. You have such a gift! Another treasure in Vermont. If it wasn’t snowing so hard we would be in our jeep right now zooming up to Shrewsbury for our lunch and one of those cinnamon buns! Wise to be inside to paint. You just create such fond memories and made our morning displaying this new painted delight! The video was an added treat. I enjoy every one of your paintings as you share them on your website. 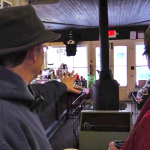 The one this AM of the Shrewsbury General Store was outstanding, just so interesting for it’s perspective. I found myself studying it, drawn into it and appreciating it’s power to draw the eye back through the store all the while browsing the offerings along the way and then a ‘Good Morning’ with the shopkeeper and customer in the the back. Thank you for this picture and all the others you continue to share. My pleasure Susan. This piece has relativity “simple” one point perspective, all lines converging the same distant vanishing point. Simple can be powerful, and appropriate more often than not. Love that picture! 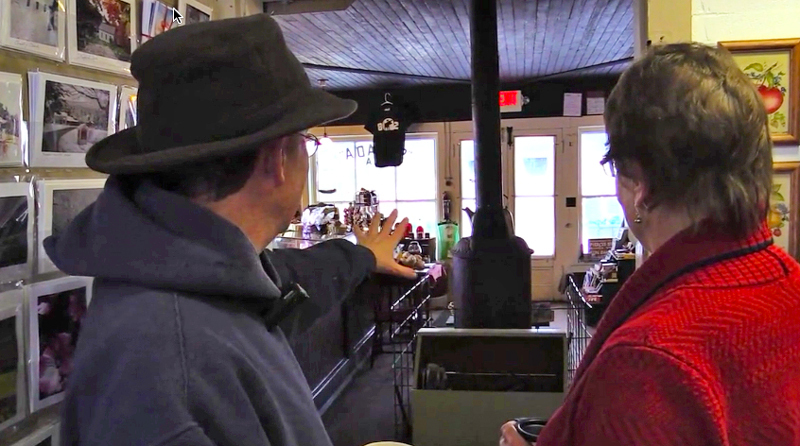 Reminds me of the Clarks’ General Store at Butternut Bend in Pawlet, VT. That was a Vermont Country store! I have such fond memories of spending Summers there. We always had a big hot dog roast and Mrs. Clark always cooked a baked ham. Such fond memories. Thank You. I know where that is David and almost remember it. Good stuff! I don’t know how you paint such intricate subjects it seems within so short a time. I am very much in awe. Looks can be deceiving Julia, this piece took about 6 or so hours to paint, about average for me. I always start strong and bold…and it seems like I get a lot done quickly, and I suppose I do. But as the painting progresses I slow down to explore and savor the more subtle nuances. (not necessarily details) In the end for me, how long a painting takes really doesn’t matter as long as I have said what I wanted to to say to the best of my ability. Not only is the painting so alive, but the video is incredible. What I love about your website, Peter, is that you take the time to teach us about the history, geography, science of the painting. Thanks so much! We are all exploring and learning together Deanie, and I love that! Wow! Enjoyed both the video and the excellent painting.Thank you for capturing a present day version of a time that is rapidly vanishing. The Salada sign in the window of the store drew me back for a moment to growing up in the town of Orange, Vt. More than 60+ years ago, a country store on route 302 in Orange Center, although long out of business even then, had just such a sign remaining in its vacant front window, a last remaining hint of the building’s former history.. Thanks very much Brain, here’s to a simpler time when Salada was the only other choice if you did not want coffee. Nice to look back, thanks. 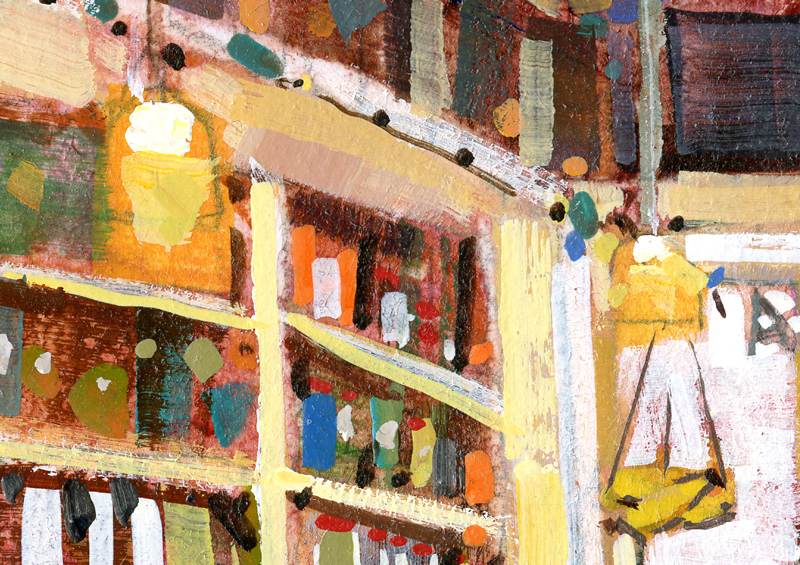 Wonderfully, nostalgic painting, fascinating history of the store and a thoughtful perspective on preserving a landmark. You captured all that in this week’s artwork and presentation. Your work is significant, Peter. Our daughter lives on Spruce Knob Road in Middletown Springs. We’re in Louisiana but visit Vermont every year at least once and love it. We have several of your prints in our home and absolutely LOVE your work and website. Please make sure to visit my studio next time you are up, I’ll look forward to meeting you John, thanks! 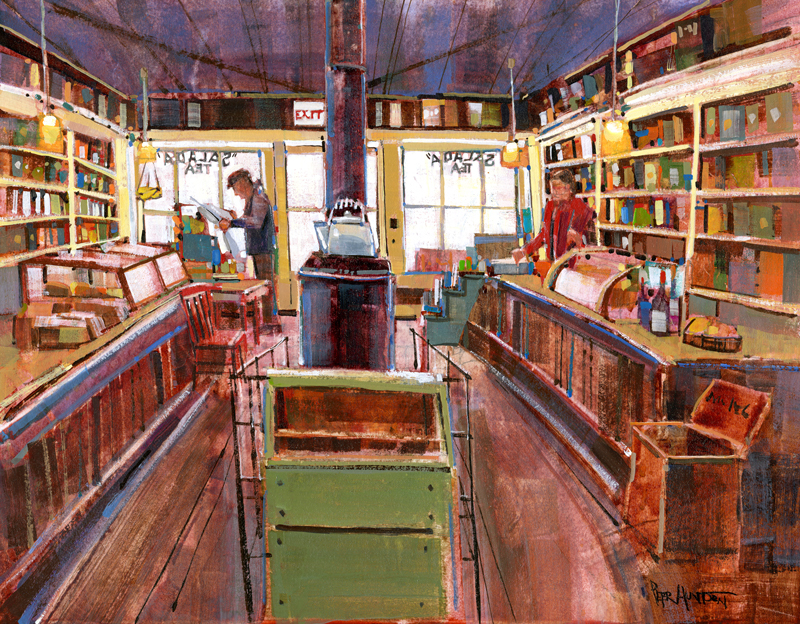 As I said before, I love your paintings of Vermont general stores and love this perspective from inside looking outward. It is very appealing to me to know that “Mom & Pop” stores really still do exist. This takes me back 50 years to when I would walk into a store and the owner would know my name. Most changes are for the better, but personal customer service is becoming a thing of the past. Personal customer service and connection is good stuff no matter where we find it, I agree Randy, where everybody knows your name. Cheers! I promise it will be worth the trip Anita. I trust your new painting has finally arrived through the storms and is hanging now? TY! Just watched the “Vimeo” of this painting. Bravo! I said when the camera pulled back and you turned around and smiled, moving the cane you use to help with perspective. The results of what you do are the best part but I am impressed to see some of the process. No matter what you show, it always feels like magic! Such a beautifully captured moment in time!!!! Just another day in Vermont, thanks Carol! Thanks very much Sukie, you gotta go to Pierce’s next visit to Vermont! Love the store. We almost bought a house in Shrewsbury a few years ago. One of the reasons I wanted it waas because of Pierce’s Store. Sucha great step back in time. Love your painting of the place. Peter, you never fail to inspire me. Thanks for sharing your gift. We miss the Meadow Sweet Herb farm down the road from that store. This summer will have to go visit the store again. You do that to people. You know that I paint what I love, Carol. Turns out nice people like you love the same things. Works out very well for both of us! Wow! I can’t believe I came across this! I grew up spending summers in Shrewsbury and knew this store well, even riding my horse to the store. My family owned/restored the original Post Office house (the pink house) in the center of Shrewsbury. The Pierce’s were great people! A real VT classic for sure Jill, thank you! Cannot wait to visit your store, i grew up in VT and so remeber the wonerful penny candy we used to get at the corner store in Castleton. The video took me straight back to my childhood and Spencer’s store on the corner of the East Poultney green. Living half way around the world I love to catch-up with Vermont from your Studio. It connects me with my home and is always something delightful. It makes me so happy to be able to help connect people to home in some small way. Thanks so much for all your support Margaret, since the beginning of A Day in Vermont, two years ago next month! Was introduced to this store by a friend who lives in Shrewsbury. You have captured it perfectly and it reminds me of other stores from my childhood. Thank you!! WOW, I never saw this painting technique – I might have to try it. Your work is great!! Thank you Nancy. I think like most mature artists, my technique is a “simple” blend of a hundred teachers, a thousand books, and 10,000 hours of painting. Use this technique as a starting point, and see where it takes you! Another beauty….that would like to grace my walls!!! This is an amazing painting. It truly depicts what I envision as a real Vermont Country store. No artificial ingredients at Pierces Dianne. Authenticity. Thanks! A stunning reminder of the charm of our state! Please post directions. Reminds me of so many scenes…the general store in East Poultney, the village office in Tinmouth, the former Drake’s Pharmacy in Poultney, Wilson’s Barbershop in Fair Heaven (oops, that’s Haven). Keep ém coming and already looking forward to your next book! I’ll keep em coming Marty, thanks for all your good suggestions!